At the first stage of what is likely to be a lengthy appeals process, the Information Commissioner has upheld the Ministry of Defence’s refusal to reveal to Drone Wars UK the number of Britain’s armed drones currently deployed. Despite the fact that the MoD are happy to give such details about other surveillance and attack aircraft taking part in operations against ISIS, the MoD insists that the number of drones deployed nor their location can be released for reasons of operational security. 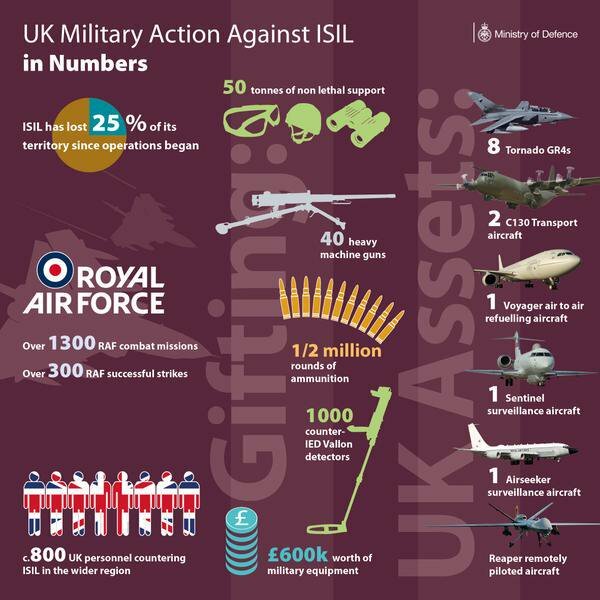 MoD has released details of the numbers of other UK military aircraft engaged in military operations against ISIS without it being perceived in any way as prejudicial to their security, capability or effectiveness. MoD quite happily released both the number of Reapers drones engaged in combat operations against the Taliban in Afghanistan as well as the location of their then base in Afghanistan (Kandahar Airfield) without security problems. MoD regularly publishes updates on UK air military operations in Iraq and Syria including details of air strikes carried out by Reapers and other aircraft which it could be argued, gives a greater insight into tactics and strike capabilities than the number of aircraft deployed. In April 2016, MoD invited a small number of media organisations – The Sun, Sky News and The Daily Signal – to visit the location of (at least some of) UK’s Reaper drones in order to interview RAF personnel operating the aircraft. While the location of the base and the drones was not directly mentioned, there was enough information contained in the reports to easily identify the base. Although the Commissioner cannot set out in any detail in this notice why she has reached this decision, she wishes to emphasise that she has considered, and paid particular attention to, the specific points advanced by the complainant. We are now preparing to appeal to an Information Tribunal. Despite regularly arguing that armed drones are no different from its other military aircraft, in refusing to release this information to campaigners and MPs, the MoD are clearly treating them differently. While it is happy to name and number other aircraft deployed on overseas operations, the MoD want to keep the number and location of its armed drones secret. This appears to be because the MoD wants to use them – or at the very least have the option to use them – on covert operations. We know some of Britain’s fleet of ten armed Reapers have been deployed to the Middle East as part of Operation Shader, as the UK military deployment against ISIS in Iraq and Syria is named. However we are not allowed to know if they have all been deployed there, or if some remain in storage in the UK, or if some have been deployed on operations elsewhere. Press reports name Kuwait as the base for UK Reaper operations in Iraq and Syria. Since the withdrawal from Afghanistan at the end of 2014, Britain’s Reapers have been used at least once outside of Operation Shader – to undertake the targeted strike against Reyaad Khan in Syria in August 2015 – a strike that the MoD has insisted was conducted separately from Shader. 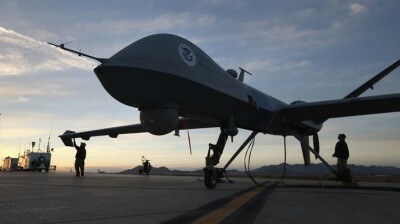 It is also certainly possible that some of Britain’s Reapers have been deployed elsewhere on surveillance or even strike missions. Without the release of further basic information, we simply cannot know. MP’s like Richard Burden, who have raised this issue in parliament, have simply been rebuffed. The MoD’s perspective appears to be that they should be able to operate these systems outside of public view and without the need for public accountability. From a wider international security perspective however, it is crucial, as more and more nations acquire armed drones, that there is a strong expectation and culture of transparency and public oversight of the deployment of armed drones. As one of the few countries operating these systems beyond its own borders, the UK should recognise that it has both the responsibility and also the opportunity to set high standards internationally for such transparency. However if the UK refuses such basic details as the number of armed drones that have been deployed, other nations acquiring such systems are likely to follow this lead. The deployment of armed drones in particular needs to be carefully monitored as they have become the preferred means of undertaking extra-judicial targeted killings. Indeed it can be argued that the technology has hugely expanded the use of targeted killing. This reason alone should make public oversight of armed drones critically important. However there is also growing evidence that armed drones are lowering the threshold for use of force. In relation to Iraq and Syria for example, although parliament limited the deployment of military force against ISIS strictly to Iraq in its September 2014 resolution, within weeks British armed drones, in defiance of that restriction, were crossing the border into Syria. Just over 12 months later in December 2015 the fact that British drones were already operating in Syria was then used, in part, to persuade Parliament into undertaking strikes there. It has long been argued that there should be parliamentary authorisation for the British use of military force overseas. Currently it is a prerogative of the Crown within the hands of the PM. However in 2011 the Government acknowledged that a convention had emerged whereby the House of Commons should have the opportunity to debate the deployment of military forces except in the event of an emergency. It has been argued by all the main parties (when in opposition!) that this convention should be enshrined in a War Powers Act, though such calls are regularly dropped when parties get into power. Eighteen months later in January 2016 amid discussion of UK military intervention in Libya, Vice Chair of the All Party Parliamentary Group on Drones, David Anderson MP, again asked the MoD if they would ensure that parliament had an opportunity to debate the deployment of UK Reapers outside of Syria and Iraq. Michael Fallon gave a dismissive, one word answer: “No”.